It is a sap-sucking bug (Hemiptera) and can reduce production. Left unchecked, the insect can kill young trees. Indications of its presence and recommended control measures are provided. Olive lace bug adults are mottled dark brown and cream, with black-tipped antennae. Eggs are inserted into leaf tissue on the underside of leaves often near the main vein. In its life cycle the bug grows through several nymph stages (instars). These are oval-shaped and wingless at first, with wing buds progressively developing from the third instar onwards. Early instars vary from light creamy or greenish-yellow to pinkish-orange. They have no spines and may be mistaken for scale crawlers. Later instars are green to greyish-black and spiny in appearance. Although most olive lace bug activity occurs on the underside of the leaf, the most common indications of an infestation of olive lace bug are on the upper leaf surface where leaves become stippled with greenish to rusty yellow dots. The yellowing is associated with blackness and dirty smears of secretions and excrement on the underside of leaves. Severe infestations can cause leaves to dry out and drop, thereby reducing the vigour and productivity of the trees. In eastern Australia the olive lace bug normally lays overwintering eggs into leaves during May to June, and it is only during spring (September to October) that these eggs hatch. At least two but sometimes three generations can be completed before the final generation adults lay overwintering eggs to complete the annual cycle. In Western Australia while some eggs may hatch during the winter months, most eggs overwinter and hatch in spring. Some adults may also survive the winter. Look in spring and throughout summer for signs of nymph and adult insect activity, especially the effects on leaf colouring from insect feeding, as described above. Olive lace bugs are relatively immobile insects. If infestation in previously uninfested groves are detected early, judicious pruning and destruction of infested canopy may control it. Insecticides are registered for control of olive lace bug as Australian Pesticides and Veterinary Medicines Authority (APVMA) minor use permits. Details of these are available on the websites of both APVMA and InfoPest. Note that the potassium soap (Natrasoap) spray has questionable efficiency against the more mature stages of the bug. Insecticides are not very effective against the eggs and work best against active populations, normally in October and November. Therefore for heavy populations two applications about two weeks apart should be made. Follow and observe the directions and requirements on the permits. Thorough coverage, especially directed to the undersurface of leaves, is essential for good control. The withholding periods must be observed, especially if sprayed on bearing trees to be harvested that season. Water-stressed trees appear to be more susceptible to attack – irrigation management and mulching will help to maintain good growing conditions. After insectide application, wait for at least a week before checking the result to confirm whether all insects have been controlled. Insectcides currently registered for olive lace bug control do not control the egg stage so it is important to check whether they have emerged before deciding on the need for a follow-up application. Successful control of olive lace bug will be evident in the following spring when the new flush of growth commences. 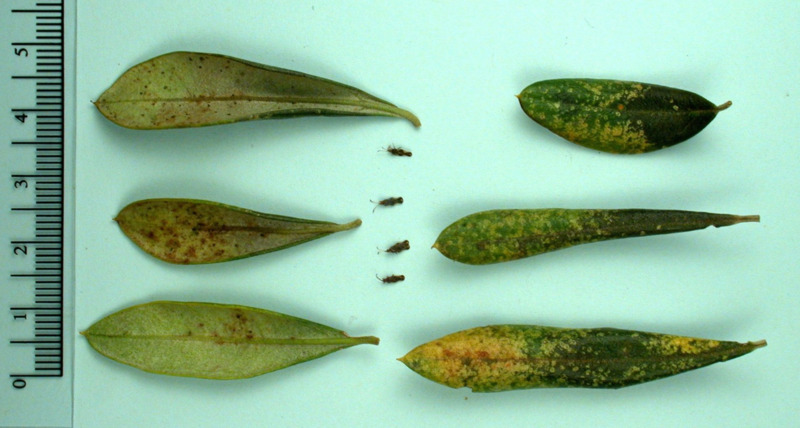 This foliage will not have the yellow mottling associated with insect feeding that will remain on older foliage. Potential natural predators, for example, lacewing larvae and spiders, are to be encouraged but are unlikely to control heavy infestations.